Blueberry muffins are super popular in my house. I make them all the time on the weekends. I generally make the same muffins, since they are the favorite. 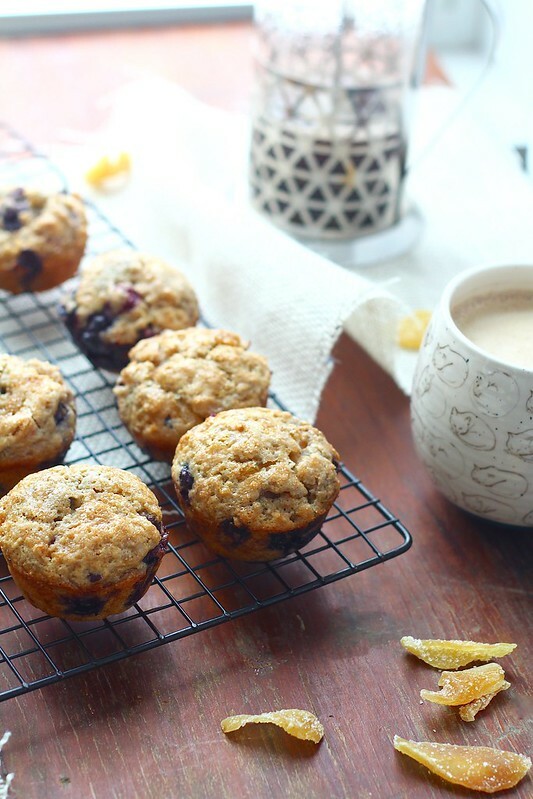 Because that particular recipe is a favorite, I tend to skip over most blueberry muffin recipes. I mean, we already love the kind I make, why try another? That is, until I came across Tara's and a thought formed in my head. 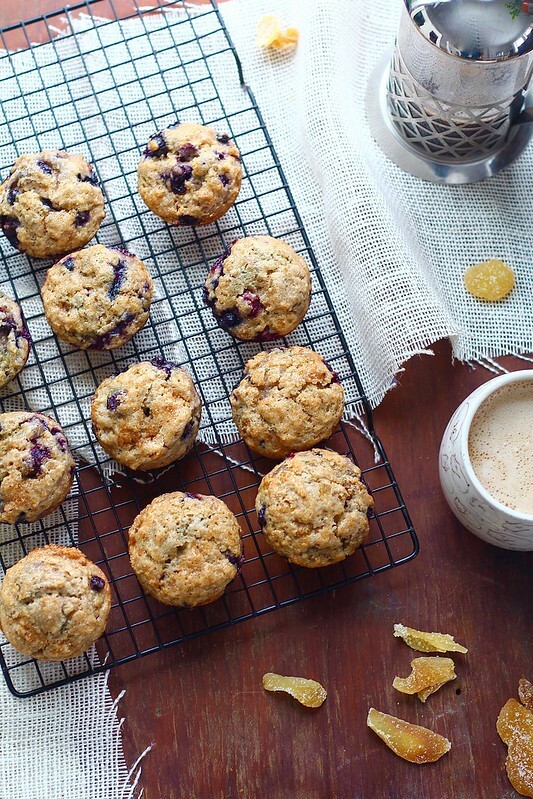 I love lemon, and I have grown fond of crystallized ginger in baked goods, so why not make a new blueberry muffin recipe that involves all of those delicious things? Lightbulb! These have become my new favorite muffin. They are moist, the perfect compliment of blueberry and lemon with little bites of ginger here and there. Nothing is too overpowering, everything is the perfect blend. And with the added sugar on top of the muffin, you get the little crunchy top. I am in love. 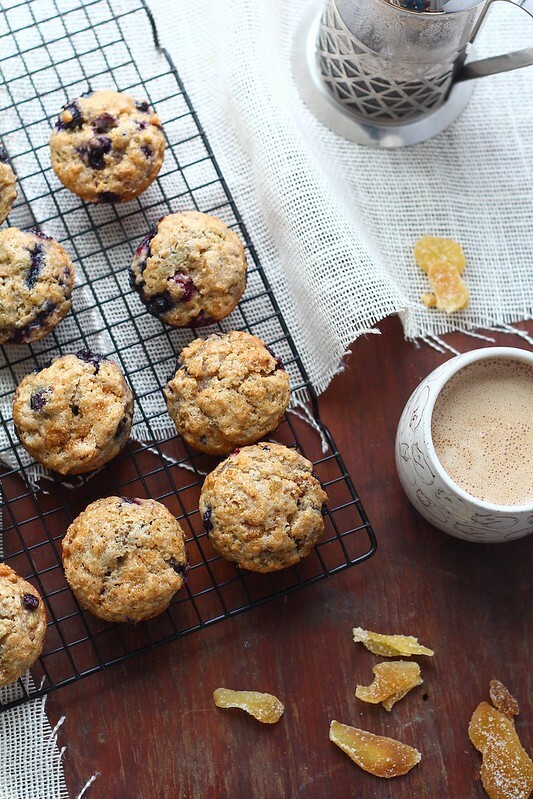 These muffins make a wonderful weekend addition. And, if you don't want to commit to eating an entire pan, freeze any leftovers! The best type of muffin right there. A treat alongside your cup of coffee or tea, just at a moment's notice. Preheat oven to 375ºF. Grease a 12-well muffin tin with butter or cooking spray. Set aside. Pour the melted butter into a large mixing bowl. Whisk in the sugar, lemon zest, yogurt, egg and vanilla extract until combined. Whisk in the baking powder, baking soda, salt and ground cinnamon. Sprinkle the blueberries, diced ginger and flour over the top of the mixing bowl mixture. Gently fold in the flour mixture until completely combined and no streaks of flour remain. Don't over mix. Divide the batter evenly between the 12 greased muffin wells. Sprinkle 1/2 teaspoon of coarse sugar over the tops. Place in the preheated oven and bake for 25-30 minutes, or until a toothpick inserted into the center comes out with a few clinging crumbs. Let cool in the pan for 10 minutes, then remove the muffins and place on a cooling rack. Serve while still warm, or at room temperature. Refrigerate any leftovers up to 4 days, or freeze for several months, thawing and re-warming before serving.